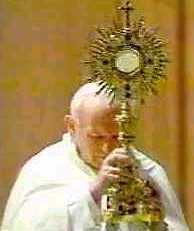 The Satanic Eucharist and Mass! The Catholic religion is no more Christian than any other cult...David Koresh, Jehovah Witnesses, Mormonism, Catholicism--no difference. Invariably someone will tell me that I hate Catholics. "Anti-Catholic" is the term they are using now. But judge for yourself: is telling the truth hate? Is telling a child, "2+2=4 not 7" hate? Nay, rather it is correction so that the person will have a right understanding. Catholic reader, get out of that sacramental system of man-made traditions that will guarantee you nothing but hellfire. Repent of your sins, believe on the Lord Jesus Christ and thou shalt be saved. The Bible says so. Catholicism is a lie of the devil. If I didn't sincerely care about people, then I wouldn't take the time to WARN you. The Catholic religion is all a bunch of Satanic lies based upon traditions and ridiculous manipulations of the Word of God. I plead with you as a friend, obey the Bible by turning to the Lord Jesus Christ in faith and forsaking the Mother of Harlots. The Great Whore of the Catholic Church will take you to hell with them if you're foolish enough to follow them. Don't do it. Salvation is NOT found in a religion, but in a Person--the Lord Jesus Christ! You need Christianity friend, NOT churchianity.